SFMTA staff explains how the transportation agency determines suitability of locations for bike stations. Photo by Courtney Quirin. Huddled around a poster in the Rainbow Room at the LGBT Center, 20-year San Francisco resident Olof Hansen scribbled the words onto a board: “End of the ‘F’ – line, enter Castro”. To his left, a crowd of cycling enthusiasts from hipsters to the business clad placed little green stickers on a map of the Mission District, Hayes Valley, the Castro and Mission Bay indicating the places they’d like to see stations for the Bay Area Bike Share come next. “Ooo, put one by Rainbow! On Folsom and 14th,” bubbled a voice from the crowd. During an open house hosted by the San Francisco Municipal Transportation Agency earlier this month fifty people shuffled from poster to poster to voice, scribble, post-it and sticker their opinions about the final stage of the Bay Area Bike Share pilot program in San Francisco. It will bring 150 blue bikes and 15 stations to the Mission District, Hayes Valley, the Castro and/or Mission Bay by early 2014. Currently 350 bikes and 35 stations reside across the Financial District and Soma, as part of a regional program launched on August 29th, 2013. A heatmap of crowdsourced suggestions received since the Bay Area Bike Share launched on August 29, 2013. Map created by the SFMTA. So what did those gathered want? “More bikes and docks” and “more dedicated bike lanes” cluttered the suggestion board while little green stickers indicating desired bike stations were clustered around hubs like 16th Street and Mission and 18th and Dolores. And what did they like? Since 2006 San Francisco has seen a 71 percent rise in cycling, particularly in the neighborhoods scheduled for the final roll out of the pilot. Comments from last Wednesday’s meeting are just “one more data point,” said Heath Maddox, the Bay Area bike share program manager. These comments will be combined with the hundreds of crowdsourced suggestions the Municipal Transportation Agency has received since the program launched. The pilot aims to bring a total of 1,000 bikes and 100 stations to San Francisco, Redwood City, Mountain View, Palo Alto and San Jose, half of which will live in San Francisco. After launching the pilot with 700 bikes across the five cities– 350 of which were placed in San Francisco– the final roll out of bikes by the Municipal Transportation Agency will complete San Francisco’s end of the deal. 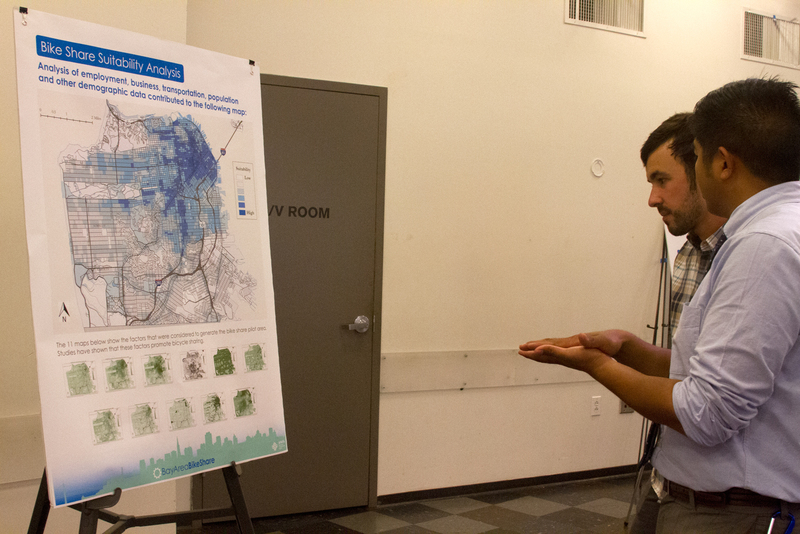 In addition to community interest, factors like hills, connectedness to the city-wide cycling lane network, average age of neighborhood residents, retail job density, suitable bicycle parking, and street width weigh heavily into decisions on where to roll out next. 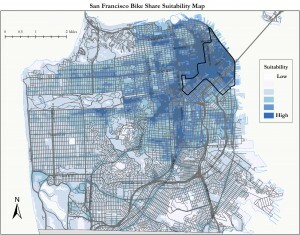 The SFMTA analyzes 11 factors to determine the suitability of bike share locations within the city. Map by SFMTA. Density of stations, however, seems to be at the core of most successful bike-share programs, with the magic ratio being 1 station for every 2.5 to 3.5 blocks, said Maddox. The density paradigm originates from the success of Paris’s bike share, which is the largest bike share beyond China. Launched in 2007 and known as Vélib’, Paris’s bike share has seen phenomenal success by placing one station every 900 feet (the magic ratio) and now is considered the industry benchmark. Striving for a success, the transportation agency has been employing the magic ratio in the pilot’s design, which is why the initial launch only occurred in a concentrated area. The final roll out is only considering a few neighborhoods within a close commute to existing bike share stations. 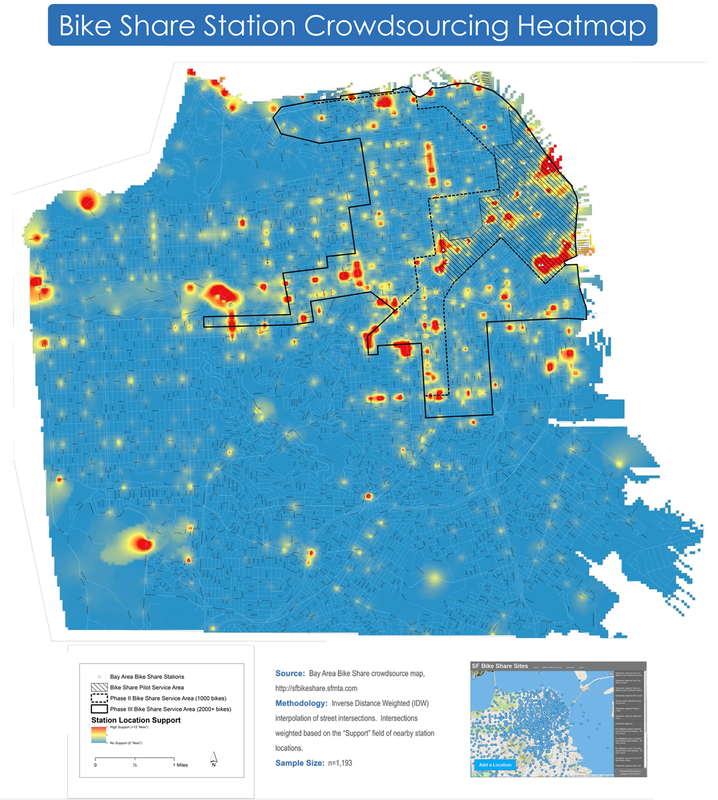 Though station density is critical to success, it also means that many other San Francisco neighborhoods will be left out of the bike share program – at least for now. “The best thing about the bike share program is not having to worry about your own bike theft,” said Adams. But, that perk is obsolete if she can never ride the bikes to or from the Richmond. Kevin Dolan, the secretary for San Francisco’s Bicycling Advising Committee, agreed. New York City Bike Share launched on May 27th, 2013 with 6,000 bikes across Lower Manhattan and Brooklyn Heights to Clinton Hill– unleashing 17 times more bikes than the initial launch in San Francisco in an area that harbors approximately 1 million people and is roughly 9 times smaller. San Francisco’s current population is 825, 863. But for some, success goes beyond numbers – cycling enthusiasts like Dolan think a successful bike share rollout will be a catalyst for increased protections for cyclists in the city. “If it takes off, it could lobby for better bike infrastructure,” said Dolan. Bike share mechanic, Adam Titone, agreed. By placing bike stations near pre-existing painted bike lanes, like the Wiggle or on Market Street, the bike share is encouraging safer cycling routes across the city. While figuring out where to place the next round of the pilot program’s bike stations was the key concern of the recent open house, expanding the bike share beyond the pilot program rests on funding. The latter has yet to be nailed down. “We need millions of dollars to do this right,” said Maddox, whose goal is to expand the program to 3,000 bikes and 300 stations within San Francisco. The $11.2 million funding for the Bay Area pilot program came from a mix of federal and local funds, mostly from the Congestion Mitigation and Air Quality Improvement Program ($7.1 million) and Transportation Fund for Clean Air ($2.8 million). Regionally, the pilot has pulled in more than $200,000 since its launch, mostly from the $9 a day and $88 per year membership fees it charges riders. While this revenue will go back into operations and marketing, the program is not yet self-sustaining and will require additional money to grow. Following the footsteps of New York’s bike share, which is sponsored by Citibank, the Bay Area Bike Share is looking for commercial sponsorship to expand, said Tom Flanigan, Bay Area Air Quality Management District spokesperson. Though the Municipal Transportation Agency is a key player in the city’s bike share, the Bay Area Air Quality Management District manages the entire regional program, which includes running the finances and securing funding. Alta, a private company that operates bikes shares in 7 U.S. cities, deploys the bikes, stations and staff that keep the program running on the ground. Grant applications, findings sponsors and negotiating across the bike share’s multiple partners are far from a fast ride.